Liquid fertilizer manufacturers are heavily investing in research and development activities to expand their business and fortify their economic prospects. For example, ‘Nutrian’ launched EZYFLOW Lupinbud to ensure essential crop nutrition & cater to soil moisture stress caused during rainfall period. Manufacturing companies are focused on formulating liquid fertilizers that could work as a combination of fertilizers and pesticides/herbicides in order to reduce the overall chemical burden on soil for broadacre and home garden applications. All agricultural resources are impacted by the seasonality; due to which different formulations of liquid fertilizers are available that cater to this need. 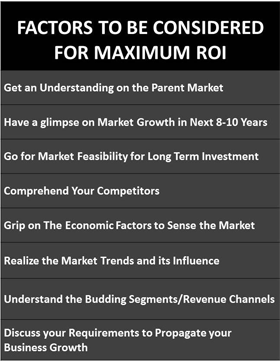 This allows farmers to keep up with the demand even during off season. 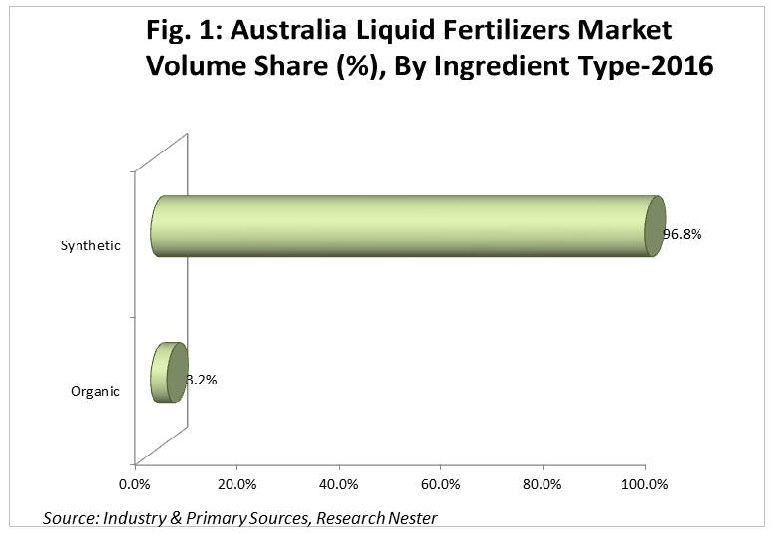 Australia liquid fertilizers market reached USD 488.7 Million in terms of value in 2016 and is expected to reach USD 645.8 Million by the end of 2024, expanding at a CAGR of 3.7% over the period 2017-2024 owing to the factors such as rising demand for innovative methods, high adoption and technological enhancement of liquid fertilizers. 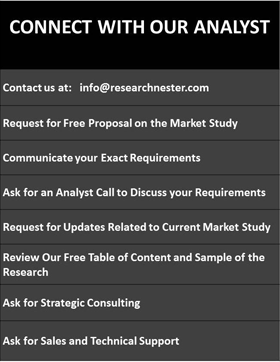 Australia liquid fertilizers market is segmented on the basis of ingredient type into organic and synthetic. 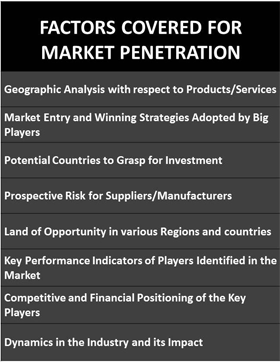 Synthetic segment dominated the overall Australia liquid fertilizers market under ingredient section by reaching 96.8% of share in terms of volume and is further projected to dominate the market with significant share during the forecast period. Further, organic segment is anticipated to reach USD 33.6 Million by the end of 2024. 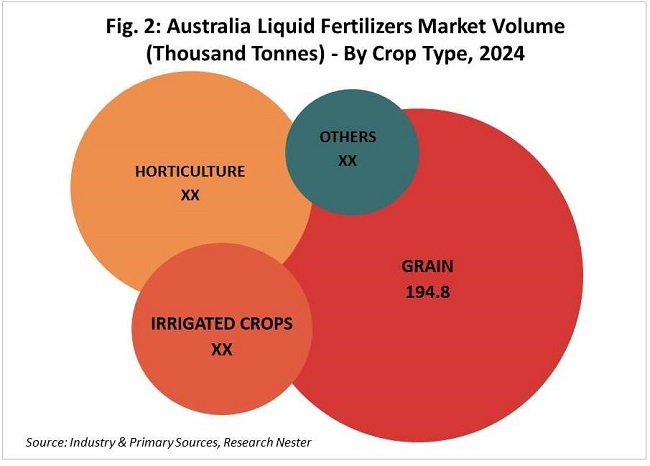 Further, Australia liquid fertilizers market is segmented on the basis of micronutrients type into nitrogen, phosphate and potassium among other micronutrients. Nitrogen liquid fertilizers segment is anticipated to have largest share by the end of 2024. 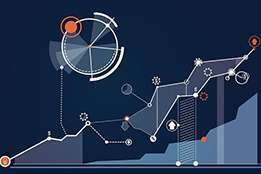 Further, in the terms of volume, this segment is anticipated to flourish at a CAGR of 2.4% over the forecast period. 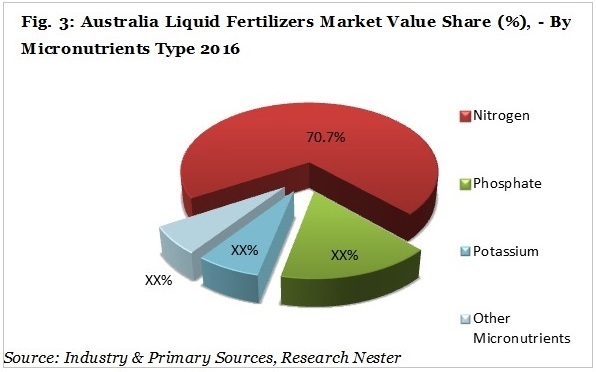 Australia liquid fertilizers market is segmented on the basis of mode of applications into starter solutions, foliar application, fertigation, injection into soil and aerial applications. Foliar application liquid fertilizers occupied the largest market of Australia liquid fertilizers. In terms of value, the starter solutions segment is anticipated to achieve absolute $ opportunity of USD 25.8 Million between 2017 and 2024. The liquid fertilizers are easier to use as compared to other types of fertilizers as they require minimal labor due to their versatile application methods. They could be applied using spray bottles for a small lawn or channeled through irrigation or sprinkler system for broadacre application. Further, the rising population along with increasing food consumption is increasing the demand for liquid fertilizers with innovative technology. In addition to that, growing demand for essential food products such as fruits and vegetables is believed to propel the growth of the Australia liquid fertilizers market during the forecast period. Presence of alternative agricultural practices that avoid the usage of fertilizers combined with strong regulations of usage and trade of various fertilizer components is expected to slow down the growth rate of liquid fertilizer market in the years ahead. 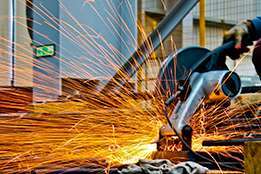 Further, the initial investment and rising cost of raw materials might hinder the growth of the market. 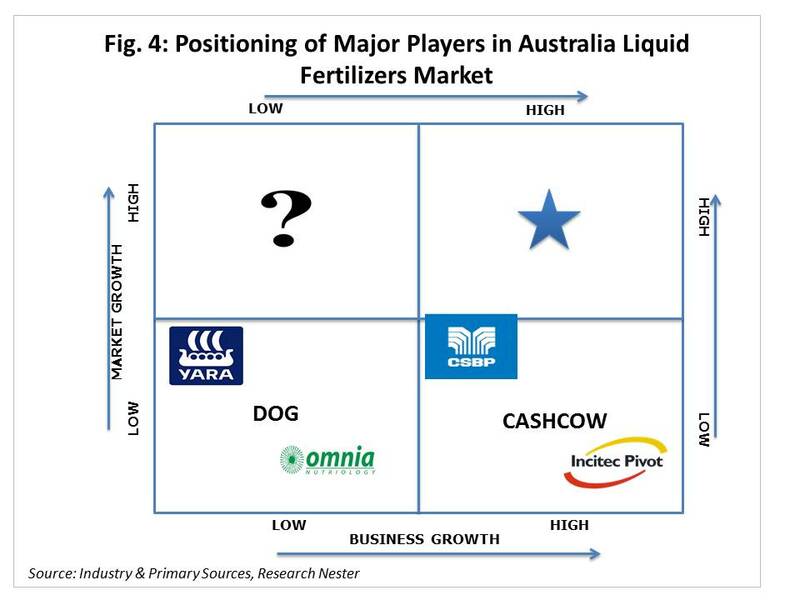 Some of the affluent business leaders in Australia liquid fertilizers market are Incitec Pivot Fertilisers, Yara International ASA, FertPro Manufacturing Pty. Ltd., Rural Liquid Fertilisers (RLF), Sustainable Liquid Technology Pty Ltd., CSBP Limited, Nutrian Liquid Fertiliser, Western Fertilizer Technology Pty Ltd., Kemgro Crop solutions, Stoller Australia Pty Ltd., Greenline Industries, Omnia Specialities Australia, Spraygro Liquid Fertilizers, Cropping Solutions (Aust) Pty Ltd.
Incitec Pivot Fertilisers, a leading manufacturer and marketer of fertilizers marked the significant market share of 45.3% in overall Australia Liquid Fertilizers Market, followed by CSBP Limited with market share of 10.0% during 2017. 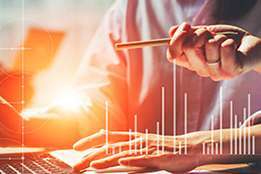 As a whole, other key players are also focusing on the development of liquid fertilizers to supplement the overall growth of the liquid fertilizers market in Australia.